A sermon for the Seventh Sunday after Pentecost, July 12, 2015. The lectionary readings are Amos 7:7-15, Psalm 85:8-13, Ephesians 1:3-14, and Mark 6:14-29. During the summers through college I worked construction. Like anyone working construction, a number of different tools became like good friends. I had my favorites: a particular screwdriver, a special set of pliers, and—especially when it was early on the site, I needed a plumb line. Our first scripture reading talks about a plum line, but I wonder if everyone knows exactly what a plumb line is? The scriptures give a context so that it’s clear that a plumb line is something used in measuring and seeing if something is “plumb” or vertically straight, right, or perpendicular. 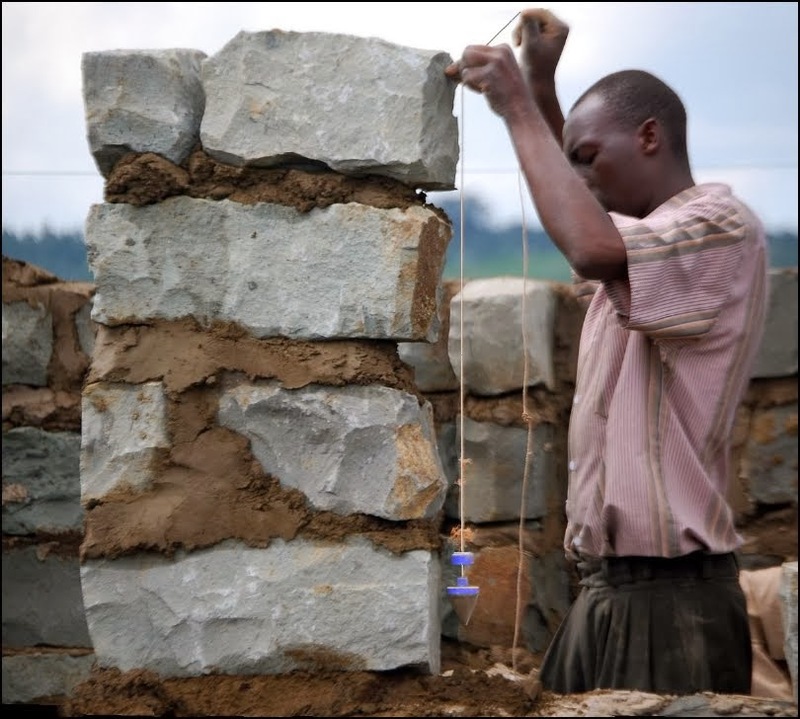 A plumb line can be as simple as a string with a rock tied on the end, making it hang fall straight. The rock is the plumb bob. Or, these days, a plumb line can be as fancy as the Leica L2P5. Described as an “all in one cross line and point laser tool with 180° horizontal and vertical lines, plus four laser points all calibrated to perfect 90° angles… [It is] the Swiss Army knife of laser levels.” If you didn’t know what a plumb line was before today’s sermon, at least now you perhaps know more than you ever wanted to know. But this is the easy part. The easy part has to do with an actual plumb line—whether laser or string, something that can be pulled out of the pocket and put to quick use. The more challenging plumb line is the one that God uses, because it’s WE who can so easily fall out of shape, out of proper proportion, and out of right relationship with God and the world. In the Letter to the Ephesians, Paul (or if it isn’t Paul, the writer who writes in the name of Paul) reminds the faithful that we are God’s adopted children. God has chosen each one of us, and even better, God has given us a built-in plumb line. It’s inside us—a way to orient us again and turn us once again to God. As Ephesians explains it, “With all wisdom and insight God has made known to us the mystery of his will,” and that will involves Christ, “as a plan for the fullness of time, to gather up all things in him, things in heaven and things on earth.” We’re made by God for love and we’re made in such a way that we have this internal plumb line that wants to help us line up with Christ and his way of life and love. But then the world gets in the way. Our Gospel reading shows us a lot of different characters and we could go one by one and try to discern what his or her internal plumb line doing. We can easily see extremes. At one end is John the Baptist, right with God, so right that he’s a plumb line for others. At the other extreme is King Herod, so wishy-washy that there’s nothing to even hang a plumb line on. He has a backbone of jelly. He’s definitely not good, but he’s not even strong enough to be bad in an interesting way. He’s whoever he needs to be in order to please who’s in front of him, which is to say he’s no thing, a cipher to be filled by the wishes of anyone and everyone. He’s so empty that in him, evil finds a happy home. Herod admired John. He thought there was something to what John was saying. He “feared” John, so Herod at least had enough sense to listen to the truth John was speaking. But Herod lacked the backbone to really hear that truth, much less hear it, believe it, and act on it. We know the story. Herod gives himself a big birthday party and wants to please everybody—his family, his courtiers, his officers and his guests. Because he so grandly promises his daughter anything she wants—and does so in front of everyone—he then feels like he has to follow through with his word, even though her request means doing her mother’s dirty work. If Herod had any sort of internal plumb line, he would have recognized that he’d had a little too much royal wine, he’d gotten a little full of himself, and had talked himself into a trap. He could have simply said, “All this excitement has gotten to me and now I’ve changed my mind”— He’s the king, after all. But it turns out that he’s no king over other people’s opinions, and since he’s a slave to pleasing others, he orders John to be killed. John the Baptist had spent his time calling people to pay attention to the plumb line of God. Find the plumb line in yourself, he said. Get right with God. Get right with those around you. And so, John the Baptist’s question comes to us: How’s our plumb line? Do we look and listen for that plumb line within us that God has given? Do we look to Christ as the example and author of what a life of love should be? Or, are we a little like Herod, easily swayed and quick to go with the crowd? The question of an internal plumb line and our willingness to act upon it has been an enormous question in the air for some time—with events in Ferguson, Baltimore, and Charleston. But here, too, this question has been very much for us since the July 4 murder of a young man in a Metro car while people watched, horrified, but frozen. Psychologists have done a number of studies on what they call the “bystander effect.” These studies suggest that the fewer the witnesses, the more likely one will intervene. But as the crowd gets larger, “pluralistic ignorance” ensues, making one look around to other people for social cues, trying to figure out what to do and what should be done. While the psychologists can help us understand why this might be, we also need Christ and images of Christ to show us what being a plumb line looks like in our day. In just a few minutes the choir will sing a beautiful anthem, “Hope for Resolution.” It was written to celebrate the inauguration of the presidency of Nelson Mandela, a man who stood for justice and what is right even when other forces would have beaten him down, or convinced him to cave in one direction or another. Mandela’s plumb line was not even overtly religious, but it truth and steady and sure. Friends, the Collect of the Day prays that we might “perceive and know the things we ought to do and may have the grace and power faithfully to do them.” With the help of the Holy Scriptures, the Sacraments, the Church, and one another, may we be plumbed to Liberating Lord Christ, who lives and reigns with the Father and the Holy Spirit, one God, now and for ever. Amen.